This has been such a fun project and I am so excited to share this home. The Stinsons emailed me about two years ago to tell me about this neat older, traditional styled home they had bought in a great Houston neighborhood. That needed to be updated. And they were starting demo of it THAT WEEK and could I stop by ASAP and see what they had in mind and if they were on the right track. So I visited the home mid “tear out” and we made some fast and furious decisions about paint and floors and they were already on track in so many areas…Flash forward two years and we are finally hanging the last drapes and placing the last pillows and its so pretty and warm and homey yet stylish and fun. Just like the Stinsons. I am honored to have been a part of seeing new life breathed into this classic Houston home. And it was a joy working with my friend Becki Griffin on photographing this project! Above are some of my favorite shots, I have so much to share from this project, this may turn into several posts. First up the entry. The home was built in the 1960s and well cared for but just needed some updated and infusing of young style. 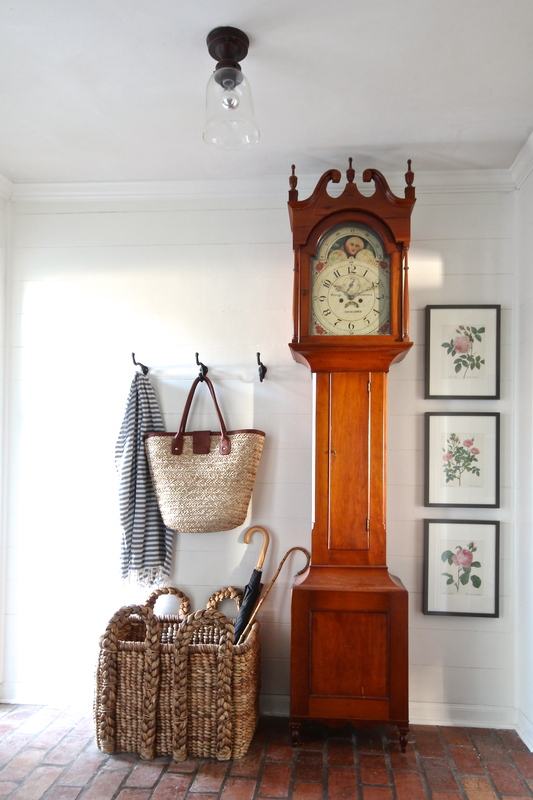 The Stinsons added the wood wall which looks so great with their antique clock. This is the before of the entry. Mr Stinson did the wood wall himself, pictured here with one of his darling twin girls. I love this family y’all. 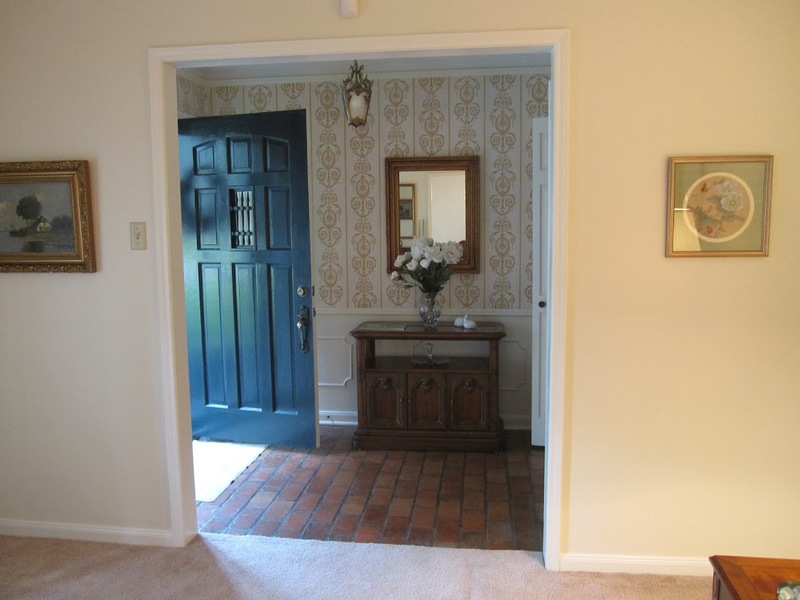 From the entry you walk into a family room/kitchen combo. We painted all of the doors BM Chelsea Gray and walls Edgecomb Gray, except for the Dining walls which are Chelsea Gray….so it all flows so well. The Stinsons slipcoverd sofas and chairs they had for the living space and we added a stripe ottoman from Pottery Barn. They have a new dog with this new home so we did inexpensive natural rugs and TILE WOOD FLOOR. Yes that is ceramic tile and I love that it can be used in all wet spaces too. They even used it in the laundry and powder room. Pearl the Lab can not hurt this floor and it looks so good. 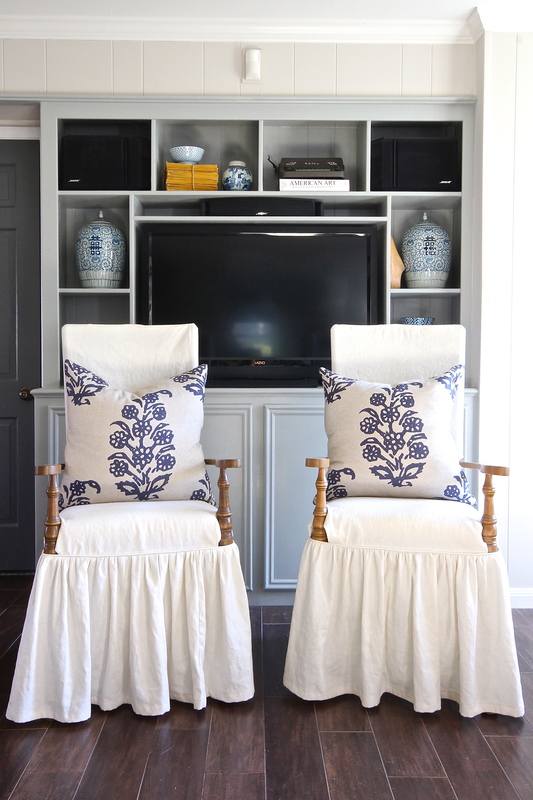 I love the Lacefield fabric pillows and the antique corner cabinet. I think the smattering of really good antiques throughout the house is what makes it really work mixed with Pottery Barn and other big box items. And the windmill “tail” ..oh the windmill…scored at Round Top last year. From the beginning, we discussed a windmill piece for this room and they found the perfect one and installed it safely and nicely! I was so concerned about installation but they did it! This homeowner can do anything, both the husband and wife. Talk about dream clients. Throughout our time working together, I would hear from them and we would visit by email or in person and I would leave them feedback and suggestions and then crickets, for weeks or months…and then I would hear from them and be so pleased with something they had done like hang this windmill or stencil a wall! Yes stencil a wall! These clients definetely took ideas and ran with them and then I came in and gave some final “polish”… I love working this way! Open to this living area is the kitchen “nook”. . . I suggested the Stinsons invest in some amazing trellis or geometric wallpaper for this space. They decided to stencil it and I must admit this scared me a bit but I was surprised how well it turned out! They are the best DIYers! I love it! And the kitchen, they removed a wall! It is not a large or “fancy” kitchen but I think this space proves that any kitchen can function well and be stylish no matter the size. 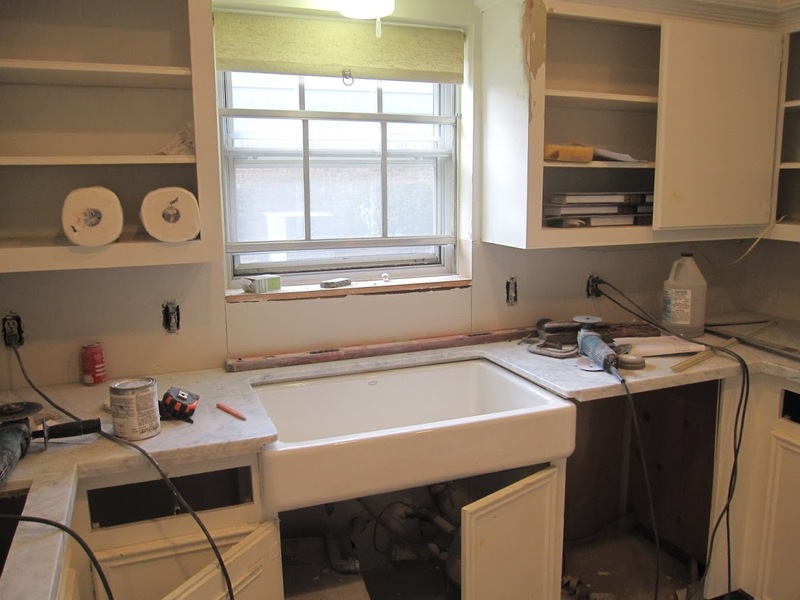 The Stinsons simply painted the existing cabinets and removed some doors and added honed marble. Notice they did not tear out cabinets and the area above the cabinets really just went away. Lighting is one idea of how they took my idea and ran with it and made their own decision based on my recommendation. I recommended several lighting options all on the pricier side (I admit it) because I think lighting is so important BUT they found these at Home Depot/HomeDecorators and I admit they look really cute..the scale is perfect! And during, they better be glad I didn’t come by and see all that stuff laying on the marble! And now, with fresh paint, some doors removed, new farm sink and appliances and marble…But this was not a total tear out or terribly expensive kitchen. I love that! The updated kitchen this is looking from the living room with back to tv area. From the kitchen you can see back around across the bar into the “piano room”. . . the bar actually was a wall at one time but the opened it up and the marble and stools make it so much more functional, open and pretty. And yes they do chalkboard art! I adore the All-Clad all hung on the wall, keeps it casual and gives a work kitchen feel and its functional! 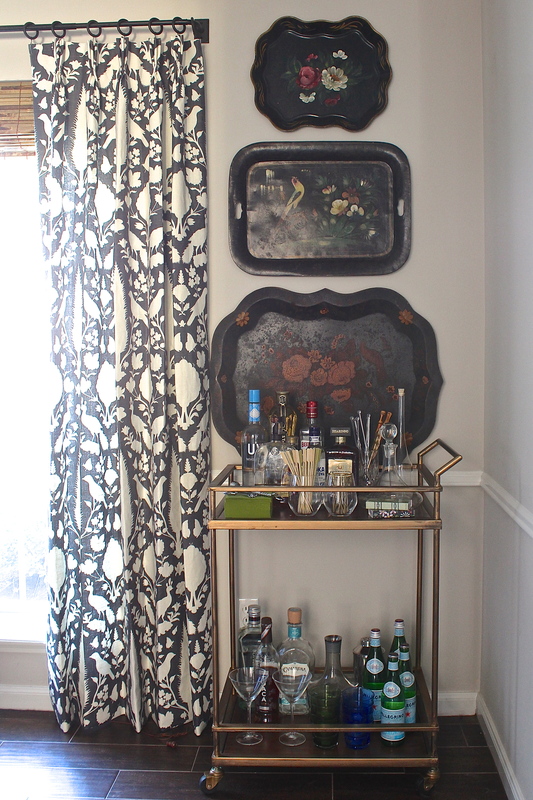 The Schumacher drapes were one thing I insisted on and the Stinsons agreed, the dark gray flows with the dark walls of the adjacent dining room and the doors of the home. And it is such a pretty view from the kitchen. This small room off the kitchen works great for the piano and two chairs. I love that they captured their girls before tweendom in these smock dresses and I especially like the size of the canvas prints. And I really like that they have a photo of themselves as a couple as well, their girls will cherish this piece one day! Samantha and her girls have the prettiest red hair! 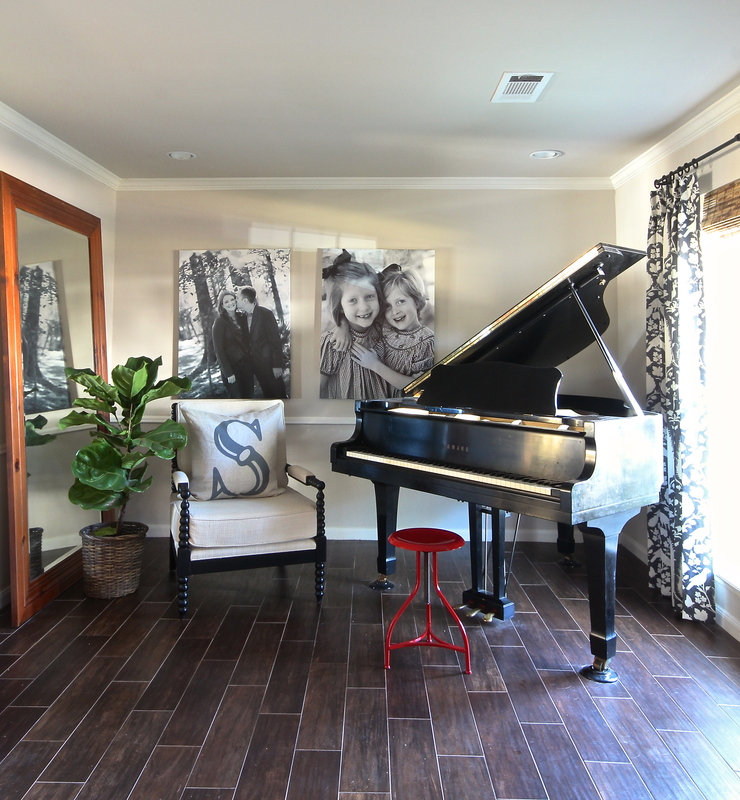 The red stool and images keep the baby grand from feeling too stuff, keeps it young and casual and gives a pop of color. Traditional tole trays from a nearby antique store on Memorial Drive in Houston. 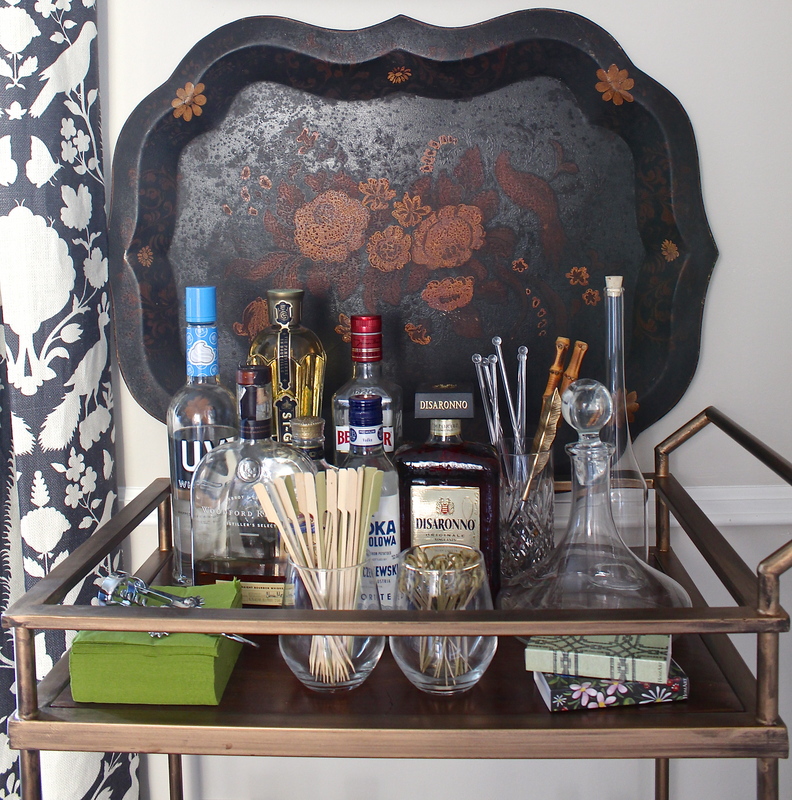 The iconic Target bar cart fit here just right! Looking through the dining room from the entry the large canvas needed to be big and it turned out great. Love the view! More white slipcovers in this room as well. We actually are still tweaking this room so I may have more photos later but we did simple linen drapes and linen slipcovers with dark walls. The red transferware adds a pop of color. We may still add and old rug for more color! 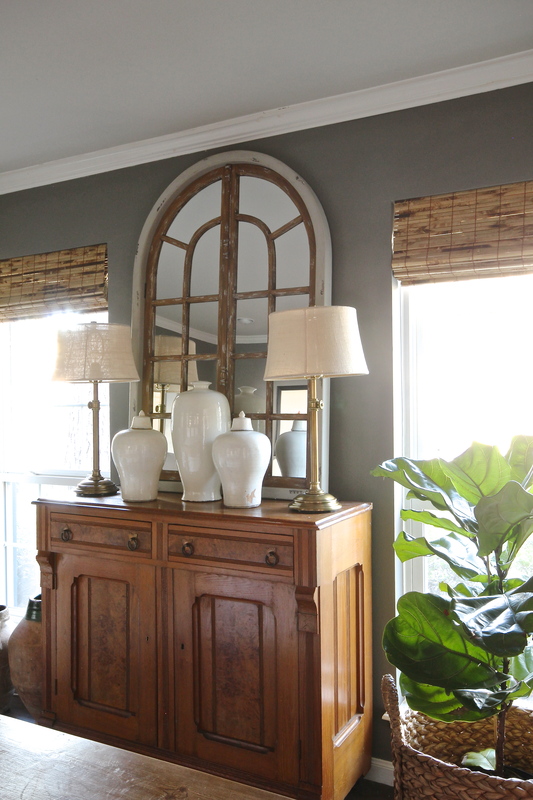 This mirror from Wisteria just barely fit but its perfect..I was sighing a huge breath of relief once this was installed…this chest was hard for me style but it finally came together. Lamps and drapes from Pottery Barn, jars and mirror from Wisteria. The chest is an antique. Now on to the Master bedroom and bath. I really need to do a separate post on the bedroom and bath (and the closet oh the closet). This transformation has really been amazing, the centerpiece of course being this salvage door. Love this bed from Restoration Hardware outlet…adore the little nails and linens from Round Top, the blue pillows are from Houston’s Lam Bespoke. Not shown (later post likely) is the reading nook and white drapes and natural shades and antique KASS. Like I said, I have so much more of this home to show. I have some fun exterior shots. They have done so much with the backyard, so charming. I have a zillion phone pics if you want to see more details, I will post more soon if there is interest. I will also followup with some more source info in there is interest. Thank you again to Becki Griffin of Curious Details for these beautiful shots and putting up with my crazy “direction” and thank you to the Stinson family for letting me part of your home. Y’all are truly a wonderful family and so talented and fun and I am so happy you love your new nest! Wow!! 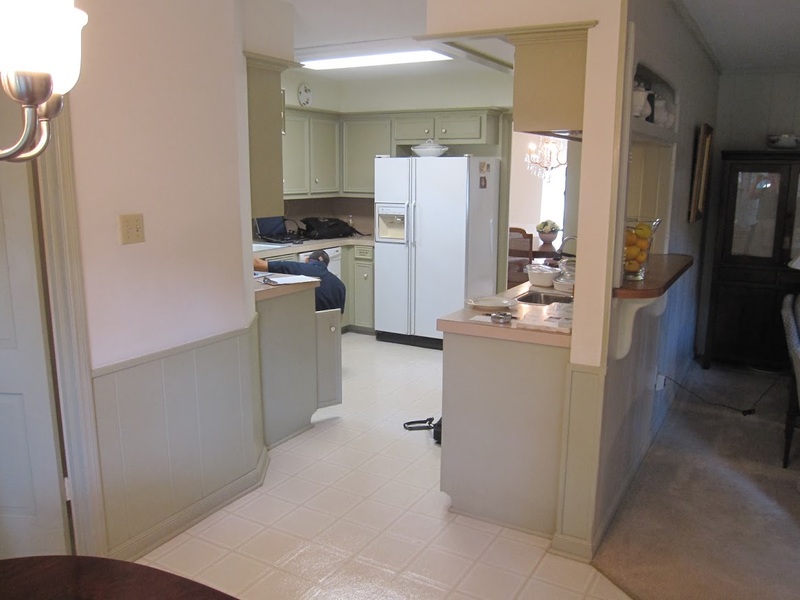 It all flows so nicely… kitchen reno without pulling out cabinets looks fantastic! Love the little chests on each side of the mastered… but that DOOR! What a treat thanks for sharing. Wow! as always it’s just right. Would LOVE to see more of this house. Love this house, Holly! It would be fantastic to see more! I loved all of it, especially the drapes in the piano room and all of the well placed antiques. I would love to see more! That is just heart stoppingly beautiful!! Everything is amazing. Great job to all of you! It’s amazing! I’d love to see more of the whole house. Can you also show you made that bar area with the stools out of the place where you removed the wall? I would love to try that. Sources, please!!! 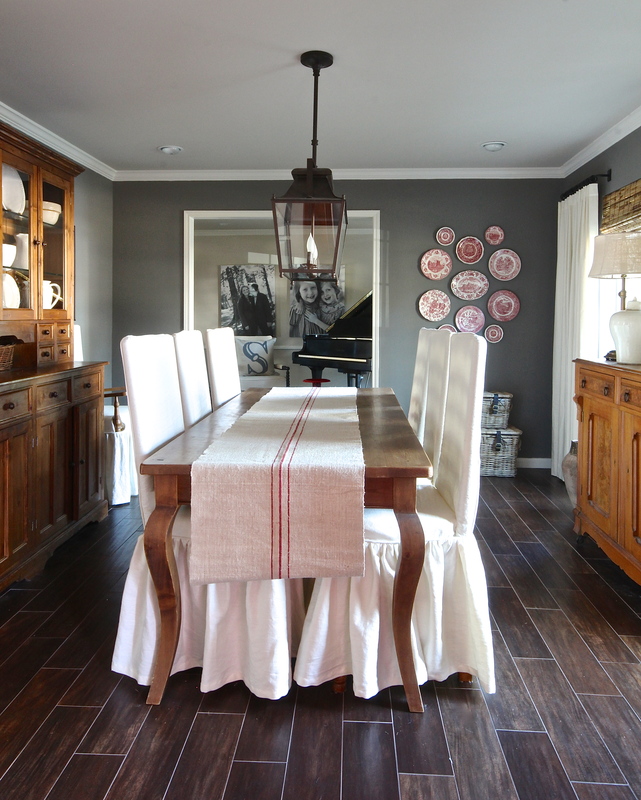 Love the dining room light..love it all, love, love, love…as always! Love, love this home and how fresh it is and the pops of red…I would like to see any detail shots you have!! 🙂 love your style and how you make homes gorgeous and functional for families!! Love everything in this house! Thank you for sharing! I hate to ask, but I’m shopping for bamboo blinds for my home. Would you mind sharing the source for the bamboo blinds? Thank you! Where are couches in the living area from? Thanks for commenting…I use http://www.selectblinds.com they have several good ones..bonito and bamboo tortiouse are my faves..you can get free samples and they do custom sizes and inside or outside mount and lined if needed…good luck! You continue to amaze me, Holly. I love your style and all your work! I particularly like: gold frame in kitchen, kitchen faucet, touches of wicker/basket/rattan, and the schumaker curtains. Oh, and the toile trays! The paint in the kitchen is BM Edgecomb Gray (flat latex) on walls and BM White Dove (semigloss oil) on cabinets and trim. Thanks for asking! This is gorgeous! So beautiful and yet it doesn’t feel too done or too perfect in the slightest. Totally homey while still being sophisticated. I would love to see more! I love every last detail! So beautiful! Please show us more! Love this! Can’t wait for more! Love your style and all the beautiful homes you help families create! You have a great and inspiring blog. Question: What is the paint(s) used in the master bedroom and bath? 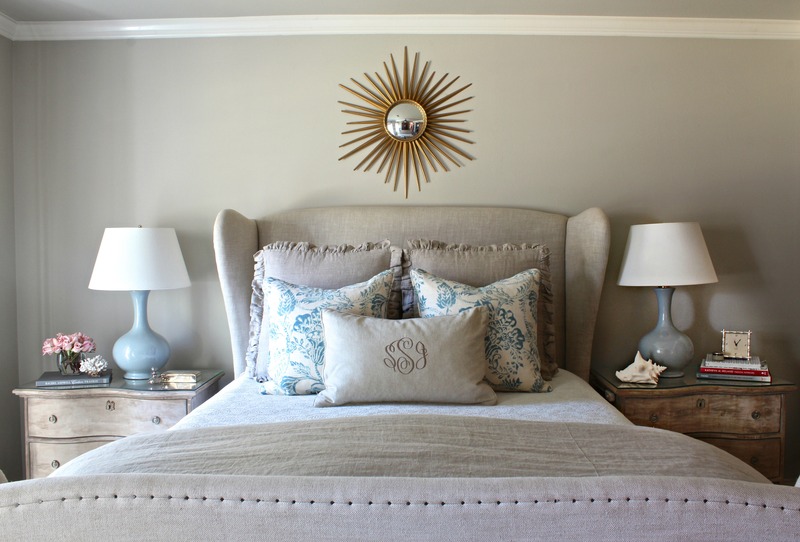 To answer your question, the paint in the master bedroom is BM Revere Pewter and in the master bath is Farrow & Ball Light Blue (I only found one store in Houston that sells this paint! But the nice man at my Benjamin Moore store told me he can color match F&B, so I might try that in the future.). Good luck! Beautiful! 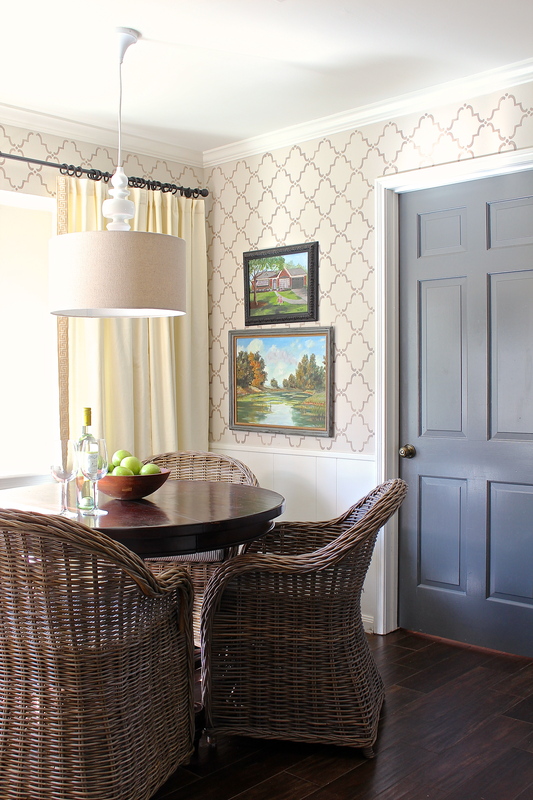 Can you share where the dining room chair slipcovers are from? The dining room chair slipcovers were custom made. If you are interested in doing a project like this, I would suggest contacting Holly for more info. She can recommend sources for good quality and economical fabrics, and if you are local, a nice man with fair prices to do the work. Thank you for your kind comment! Can you tell me the source of the slip cover fabric? I’m interested in doing something similar but need a white that will cover a bold print underneath. I love this house and would LOVE to see more pictures!! Beautiful work! I love that kitchen! 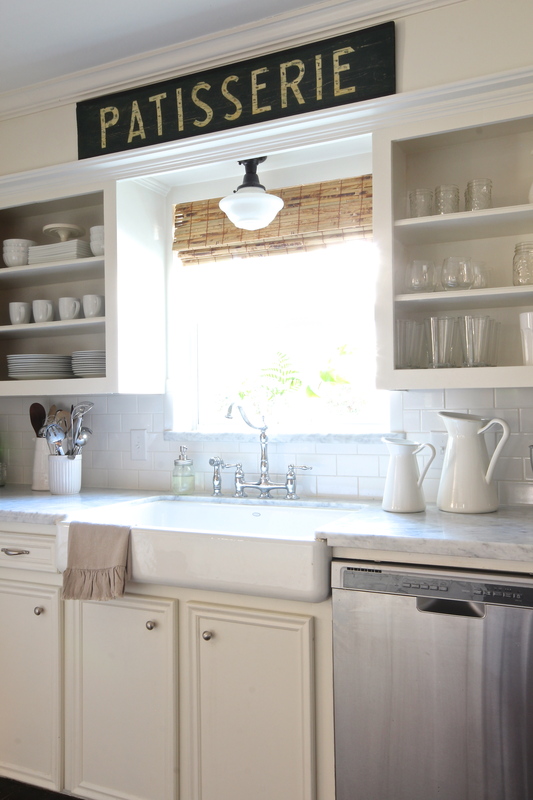 The pendant lighting, faucet, white backsplash, white dishes – so lovely! What a beautiful, livable home. Once again, you’ve done a fantastic job, Holly! Love this transformation – looks like a wonderful family home! Would love to see more!! I think I love the whole house! I wish you had your name watermarked on all of these shots. I want to upload them all to my Pinterest Boards! Every space in this house is gorgeous!! Love the use of ticking, toile trays, linen and wicker – all my favorites. So much inspiration! YES OF COURSE WE WANT MORE! MORE! MORE!!!!! Always LOVE everything you do. More pics and sources, pretty please! Lovely home. I see “Holly touches” everywhere. I’d love to have a source for the two nightstands. And I’d be interested in more pics, especially of the backyard. Holly, this may be my favorite project you’ve ever done! I love every little detail. I’ve gotten so many ideas from this post for our house. Thank you! Oh my goodness – where to begin?! I love every detail Holly! Well done girl! Love it all. I even have a screen shot of that breakfast nook on my phone; can’t remember where I found it (maybe Curious Details instagram via you?). It’s all so lovely. Beautiful – I nearly pinned every picture from your pinterest page!! This family lives super close to me and I know exactly what antique store you are talking about! Are the breakfast nook chairs from World Market? I’ve been trying to find them and they are sold out everywhere. If they aren’t from World Market, do you mind sharing your source? Thank you! Glad to hear from someone who is a West Houston neighbor! I wanted to let you know that I have had luck shopping at Rummel Creek Antiques on Memorial next to TJ Maxx. And, yes, we did get the breakfast room chairs from World Market on Richmond based on Holly’s suggestion. Thanks! This may be one of my favorite projects that you have shared! I just love all the details from both the homeowners and you! Excited to see more!!! Beautiful work! Holly, This is absolutely beautiful yet I can picture this cute family living so comfortably in this home. Many homes that are done with help from designers do not look “real” but his one does yet is gorgeous. Do you do on line consultations? Would love to see more pictures…..all thousand on your phone! ….especially of the backyard. I love landscaping. Thanks for sharing. Absolutely gorgeous!! Can I get more details on that wood tile, please? Here are some details about the wood tile. First of all, we love it! We got it from Floor and Decor, but also found some that we liked at Lowe’s. It even has texture like hand scraped wood. The secrets to installation according to our tile guy are to use dark grout and tight grout lines. That way it looks like wood and not tile. We would highly recommend it for areas that are high traffic or could get wet. Thanks for asking! Absolutely wonderful – I love every detail. Thankfully, I am home alone, so no one hears me ‘gasp.’ Girl…..you’ve got it! This home is gorgeous. What paint color are the cabinets in the family room? Thank you for sharing this home with us! 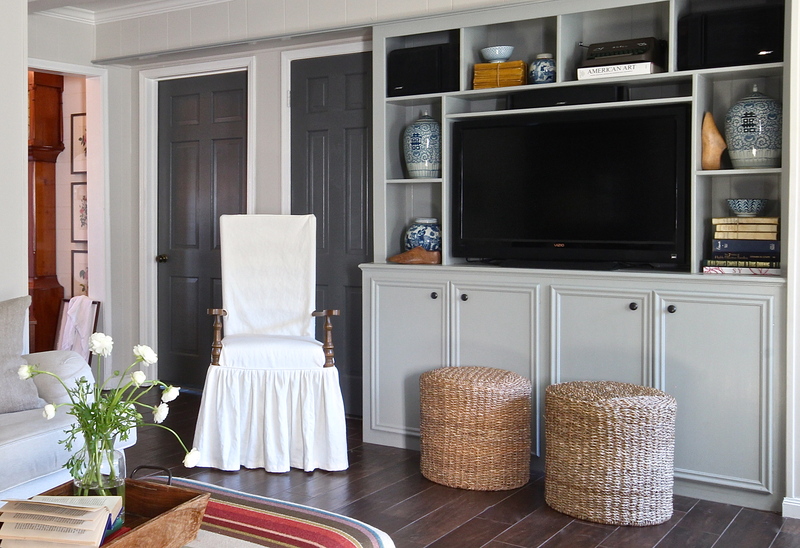 We painted cabinets in the family room BM Fieldstone Gray as Holly suggested. Thank you! people is such a blessing.. I love the house. Please post more pictures. Holly got the jars from the Wisteria outlet in Dallas. Hope this helps! Gorgeous! More photos and resources please! Would love to know the color that was used in the master bath. So pretty! Thanks for your question. We used Farrow & Ball Light Blue in the master bath. It is a neat color that changes with the light but always looks pretty. Take care! Beautiful home. Holly, it has your pretty fingerprints all over it! Would you share the source of the chests used for nightstands in the master? Looking for those! Oh my gosh! Gorgeous and so many questions! What a beautiful home… I’d especially love to know about the process to retrofit the farm sink in the existing cabinets and about the light fixture over the dining table. You very well could have posted that info above… I was too distracted by the pictures to notice! What a beautiful job! Thanks for asking about our kitchen sink. It was a neat find. It is a Kohler Apron Sink with a short apron. It is designed to retrofit a traditional sink with the least amount of cost/effort. The top front of the cabinet was cut away (where a false cabinet door was), but the apron is short so not to interfere with the existing lower cabinet doors. Good luck! I forgot to answer your question about the DR light. Holly gave us choices of lantern style lights from Restoration Hardware and some other online sources, but ours came from Pottery Barn. I would love to know where the couches and kitchen nook chairs are from. Looking for similar ones and having a hard time! Thanks! We got our family room sofas from Star Furniture when we were first married. After 13 years they needed a makeover, so Holly suggested that we have them recovered. But she has sources for similar new ones if you are interested. The breakfast room chairs were from World Market. Again, I’m not sure they are still available but Holly can help you find something similar. Thanks for asking! I love all that I’ve seen! So, yes I’d love to see more! Holly, we’re so proud of your work and flattered by all of the kind complements. Becki’s pictures are beautiful. Working with you was fun, and we’re really glad to know you. For the readers, we wanted to share our very positive experience. We had so many decisions to make quickly in every room in the house, and Holly was indispensable in guiding us. She came out to the house about 3-4 times over an 18 month period, and each time we take her action plans and run with them. She would create boards to guide us and would have information about where to buy the items. She used a nice mixture of products from catalogs and unique finds. Then we could check in with her to get specifics when we had a tough decision to make. For example, when we had a half dozen tole trays at the antique store, we texted her a picture, and she guided us on how many and which ones to buy. She was always very responsive and so helpful. Holly is fantastic in challenging your thinking to try new things, and she also listens and incorporates your style. For all of the Holly fans out there (we found her through the blog too), we encourage you to contact her to see how she can help. I love it! You do such a great job and I’d love to see more of this home! Such character! Holly… this is incredible!! Love everything about it! Do you know what material they used to plank the foyer? I want to do this in our house, but the boards I’ve found don’t seem to be as wide as the ones the Stinsons used. I need to go back slowly over all the pics. I was so excited about each one that I was scrolling way too fast 🙂 Great job!! I had to talk to James to get the scoop on the horizontal paneling in the entry. He said the trick was using really thin wood. That way the paneling did not come away from the wall beyond the baseboard and door trim. He said that he got big sheets of this thin wood from Lowe’s and cut it into planks. The other trick was using a nail gun! Thanks for asking! Such a cozy home. I love all you did. Would love to know where the wooden blinds came from. Look forward to more photos. Window coverings was one of the first questions I had for Holly. She steered me away from expensive wood shutters, and told me to get wood shades in Bamboo Tortoise from SelectBlinds.com. We installed them ourselves on every window in the house. I never would have made this choice without Holly’s input, but it was a good one. Thanks and take care! This all looks amazing!!! What color did you use for all the cabinets and trim with you grays? Thank you for the complement! Anything painted white in the house (ceilings, trim, kitchen cabinets) is BM White Dove. Take care. Sweet, beautiful , comfy, welcoming, lovely… I would love to see more please. What a happy home!! Thanks to you and the family for sharing it with us. It’s all so lovely! Absolutely love the home- it so so elegant, but most importantly, livable!! My husband and I are fellow Houstonians and have been looking for an older home (DIY is encouraged in this family!) that we can transform into our own. Any recommendations on neighborhoods? We both grew up in Bellaire/Meyerland area and it is mostly picked over or doesn’t have enough square footage for us. Any input or suggestions?? Also, I am just LOVING the tile floors. We have a large lab pit bull mix and 2 cats, so pet and child friendly is a must. What is the source for yalls? They are stunning. Thank you for your kind comments. To answer your questions, we chose to live in SBISD because our girls go to exemplary schools, and it is 20 minutes to my husband’s office downtown. Regarding the “wood” tile floor, we got our tile from Floor and Decor. Take care! I am a big “Holly” fan! Love your aesthetic so much! Comfortable, casual and elegant all rolled up into one! I’m convinced I need to inject a little “Holly” into my home for a much needed lift! As always, BRAVO! Oh my gosh!!! What is not to love?!! I adore this house! It is perfection. Warm, cozy, stylish, fresh, functional…I could go on and on. You hit another home run, Holly! absolutely beautiful! So sweet! Yes! Please more photos! Would love to see the backyard! Well done! Thanks for your question. Holly recently introduced me to Lam Bespoke, and I now have a few items from there. It is a nice store with good service on West Alabama. It’s more expensive than where I usually shop, but Holly actually found the bedroom pillows there at half off! Thanks again for asking. Their home is absolutely beautiful and such a beautiful family. Yes, I would love to see more. I absolutely love this style. It would be great to know more about the brands they purchased, where and price, if they don’t mind sharing. I am so jealous they can do this themselves….gosh, I wish my husband and I were that talented. The windmill is fantastic and all the special touches. This is what makes a house a home. Love the tile floor that looks like wood, how is that working for you? We have furbabies and must have easy to keep flooring. They are definitely part of our family (3 dogs, 1 cat all rescues). I also really like the size of your entertainment cabinet, did y’all make it or purchase it or repurpose something? The colors are all great and many of these I have chosen for our home. Have seen a lot of black doors but really like the gray y’all chose. Thanks so much for sharing. Thanks for your great comments. We love our “wood” tile floor! I thought I could take care of a real wood floor, but I can’t tell you how many times I’ve spilled something and felt grateful that it was tile. Regarding the TV cabinet, James designed it on paper to fit our TV and we had it made. Take care! Everything about this home is just fabulous! What a wonderful partnership you had with this couple, they made the vision come to life beautifully! Holy cow, Holly. This is SUCH a killer house!!! I’m just so in love. We just got into our new build here in Houston (Cypress) and I’m stumped with so many parts of it. I’m probably going to need to get you in here. I just walk around stumped all the time. Anywho, I can’t wait to see more of this place! oh Holly- you’ve done it again! Samantha & James- what talented DIYers. Gorgeous. Please please give us more. Give it all. Such a treat to see things done that look real and not staged. My daughter and SIL are in the process of deciding what they want to do in the new house in Atlanta and I always get good ideas to pass on to her! Thanks. Gawd, girl, you really just keep rocking it!! Great clients help. This house is just so restful, beautiful and perfect. Wonderful job by all. Envy being young and just starting when I see these homes. Would love to junk most of my 35+ accumulation & begin again! Just lovely. I’ve looked at this blog post over and over again. LOVE the entire project. I’ve pinned several images as well. Beautiful work!!! Thanks for sharing. Can’t wait to see more images! This home is almost the identical floor plan to our home in Conroe. I love what you guys did with it…we bought ours last July and have done some renovating, but have plans to do more! We just love our home and these pics are so inspiring. This might be my favorite post of yours ever! Holly and Stinson family this is awesome! We love love love the floors!! We live in a 1970s home that we are updating. Going to look into these floors!! Please show more, love it! Oh!!! I really enjoyed this loving home. It is stunning and full of style, great work everybody. Now please Holly do us all a favor and share more pictures. And thank you Stinsons family for opening your doors, such a generous gift. Thanks so very much 😉 hope to see more soon! OF COURSE there is more interest – please bring on more of this young Houston home!! Let me just be like everyone else to say that this home is beautiful, warm and perfect in every way. Fantastic job of updating and of course your styling and touches make it!!! So much talent Holly. Holly all day yesterday, all morning…I keep coming back to drool over these photos! So gorgeous! 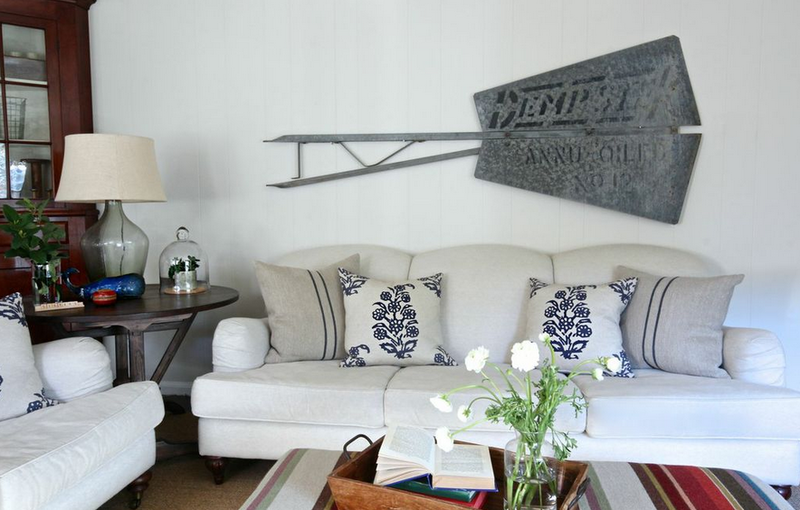 And those Schumacher curtains…great call…WOW. So refreshing to see this project!! Love how it looks so good and you really used what you had (older cabinets with the soffits above them, paneling in the den, existing floor plan, etc). This area is an area where it is becoming more and more common to be enticed by builders to just tear down that beautiful old home and build a McMansion. Really excited to see this! Good job Holly and Samantha! Holly and Stinson Family–what a collaboration! A mix that shows professional design with homeowner’s personality shining through at every opportunity. The changes are beautiful, the choices are timeless. Inviting, warm, full of charm and authenticity, most certainly a place for making memories to last a lifetime! Please, show us more of this charming residence! Beautiful–all of it! I keep thinking about your question and wanted to add that my opinion is mixed on this light fixture. It looks good and is a great price, but it is basically an exposed light bulb. It has a clear glass shade and is open at the bottom. It came with a neat looking Edison bulb, but that wasn’t bright enough for the entryway. You may be able to see in the pics that I am now using a special bulb that is silver on the bottom to cut down on the glare. Just wanted to let you know what you’re getting into if you buy this light fixture! Love the space – really beautiful. I can’t believe the kitchen transformation – AMAZING! LOVE this!! I do hope you do another post & give sources. Hi. Love the work you have done. Thank you so much for sharing. Can’t wait to see more photos etc. I was interested in finding out about your dining room table. Looks perfect for what we are looking for. Thanks again. We got the dining room table from McLaren’s Antiques & Interiors in Houston when we were first married. The Houston stores have closed, but we were excited to see that they have a store in Round Top (it looks to be open year round, not just during the antiques weekends). If asking about the table, I would describe it as reclaimed wood with cabriole legs. Thanks for asking! I love this house! It’s so well done and cannot wait to see more! Soon, please!!!! Absolutely perfect! I went immediately to Select Blinds to order a sample of the Bamboo Tortoise. Was unable to locate that color and after chatting with a rep was told it was discontinued. Can you recommend another color or place to purchase? That color would have been perfect for my home. Thank you! Bummer about bamboo tortoise being discontinued! Holly referenced another color in an earlier comment, and I just looked it up on SelectBlinds.com. It is the Extreme Woven Wood Shades in Bonito. The image on my screen looks very similar to my shades. Hope this helps! Hi Samantha, Just FYI, the Bamboo Tortoise blinds are back in stock at Select Blinds now: http://www.selectblinds.com/bambooblinds/bamboo-shades-details.html?clrid=619 . Thanks! 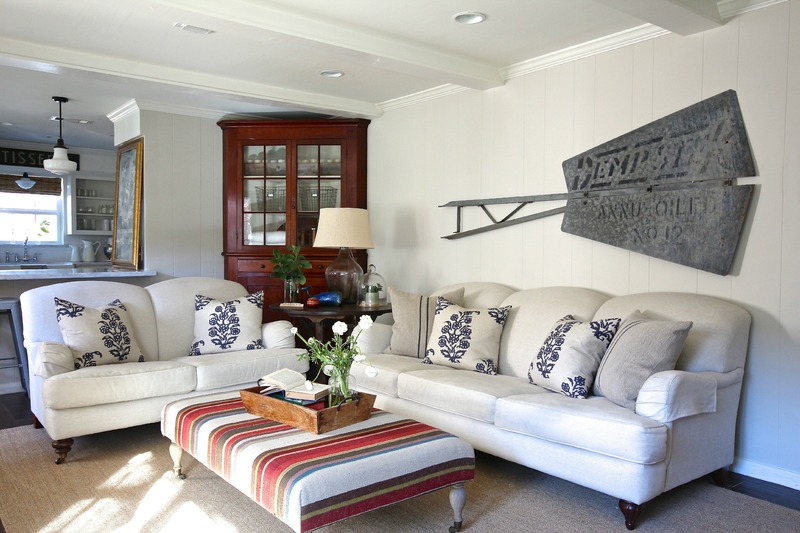 Holly, I love your blog and love how this home turned out. It is lovely! Would you mind sharing the source for the pendant light above the kitchen nook table? thanks so much! Thanks for your comment. The breakfast room pendant is from West Elm. I can’t find the exact same one on their website, but there are a couple of similar ones. Take care! I can’t keep looking at this house, especially the kitchen!! I just love it! Just wondering & can’t tell from the pictures, did you remove the doors on all the upper kitchen cabinets? It’s funny you ask this question because I was just thinking this weekend that I was glad to still have some cabinets with doors to hide the not cute stuff like Tupperware! There is one big upper cabinet with a door to the left of the refrigerator and the little cabinets around the microwave also have their doors. Thank you for your nice complements! Yes, more posts and more sources! Where did you get the special lightbulb? Gorgeous home! Where is the kitchen faucet from? The kitchen faucet came from Amazon.com. It is the Premier 120344 Two-Handle Bridge Kitchen Faucet with Matching Spray, Chrome. Thanks for asking! I keep coming back to these pictures. Your home looks amazing! I also love the pictures of your patio and repurposed light. The pops of red are so happy. I hope more pictures will be shared. The red door color was a Holly recommendation–BM Moroccan Red (semi-gloss latex). The monogram is from Etsy.com. There are lots of sellers that make them, and I just searched for the least expensive. It is 24″ and comes in raw wood. I spray painted it white. Would you mind sharing which fabric your bed is? I see many options on RH website. Your home is beautiful! We got the bed from the RH Outlet in San Marcos, TX. The fabric is Belgian Linen and the color is Sand. Thank you for asking! Thanks for your nice comments. I think soffits are such a weird invention–don’t you? We added a big piece of crown molding at the top and painted the soffits and cabinets with the same paint (BM White Dove semi-gloss) to make the soffit look like a part of the cabinet. Take care! Actually, my favorite is the little towel over the kitchen sink with ruffle.. so cute! I noticed that you said you got the sofas from Star Furniture when you first married but Holly knows about some that are similar. How would I find out? Just click the “Contact” button in the top right corner of this page and tell Holly about your project! Good luck! Just wondering where the kitchen drapes came from? I adore the trim. I’ve been looking at the Wisteria chests for my bedroom. Did you put glass on top? Yes, we put glass on the tops of the bedside tables to protect the wood. James made a template with kraft paper, and we took it to a local glass place to have them cut. Take care! The drapes in the breakfast room are from Pottery Barn. The trim came from Hobby Lobby, and I sewed it on. Thanks for your comment! 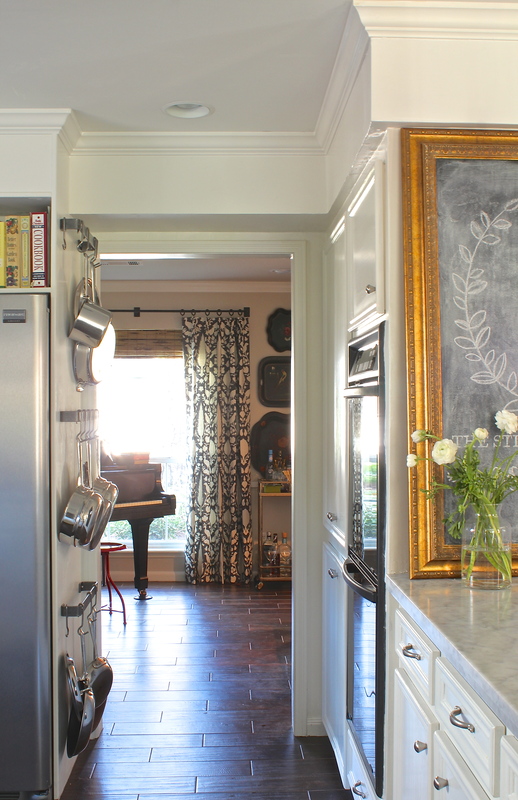 I saw photos of your kitchen on pinterest and especially love the gold-leaf chalkboard. May I ask where you purchased it from? 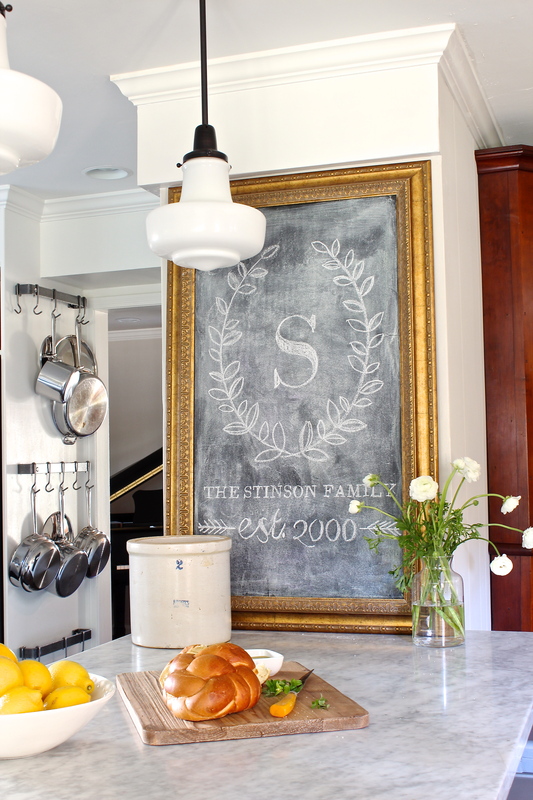 It’s the most elegant chalkboard I’ve seen, and I have young children and would love to find one! Thank you! Sorry to take so long to respond to your comment, but thank you for it! We made the chalkboard by buying a framed picture at Garden Ridge just for the frame and replacing the artwork with a board painted with chalkboard paint. I got the idea from a picture in a magazine. Hope this helps! So wonderful your home is!!!!!! Extremely inspirational as I have been on my small home for awhile. 🙂 I was wondering how tall your bar stools are? 24inch or the 30 inch? Thanks! Sorry for the delay writing you back. The stools are from Overstock.com: Tabouret 30-inch Metal Barstools. A lot less expensive than Tolix, and we have been happy with the quality. Hope this helps! Thank you Samantha! Perfect! I just needed to confirm that I would need 24 inch since it looks like my counters are lower than yours. Thanks again! Cheers! Love the whole house and always love everything you decorate. Do you know the name of the tile that looks like wood? Where is a good place to get bamboo shades and pillows with monograms? Thanks. Could you please tell me the colors of paint used in the house? Love this house and would LOVE to see yard pictures. I’m sure I would love their garden style! Hey Holly and friends! LOVIN’ these wicker chairs in the kitchen. Read through the comments and saw that they were from World Market. It looks they are discontinued now. 🙁 Do you have a similar recommendation for these? My heart is SET on them! 😉 Thanks! i love the kitchen. 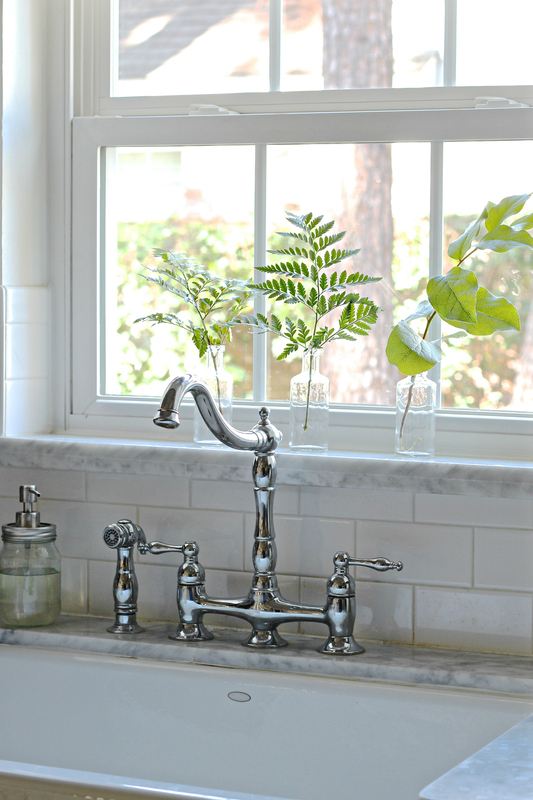 Love the sink and the faucet. I see the sink is from Kohler, where is the faucet from? I did look at all the comments, but Samantha, I would LOVE to know how your gifted hubbie did the plank walls. What material? What width? How? Is this possible to retrieve from him? I plan to do JUST what you did in my entry…Holly was so helpful and encouraged me to go for it~! 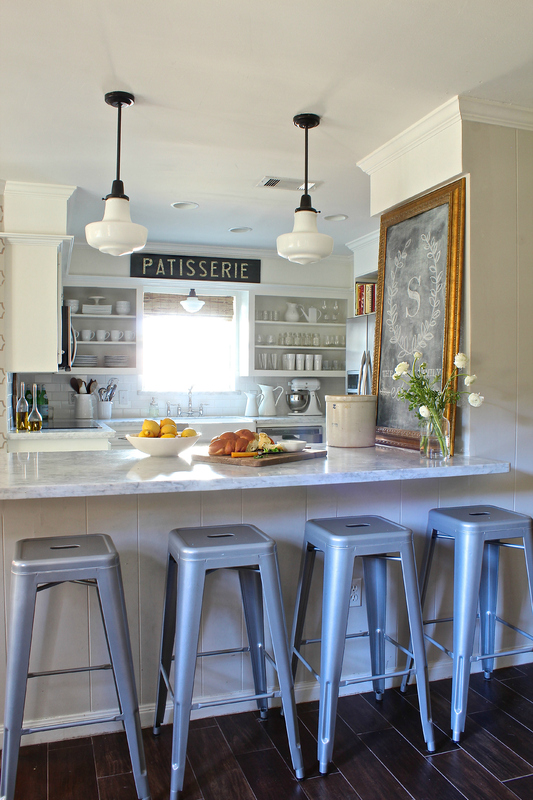 Can you tell me the paint color that you have on paneling below the island/peninsula with the silver bar stools? Also can you share the details on your kitchen countertop? Love it all! I just keep coming back to these pictures of this beautiful home. 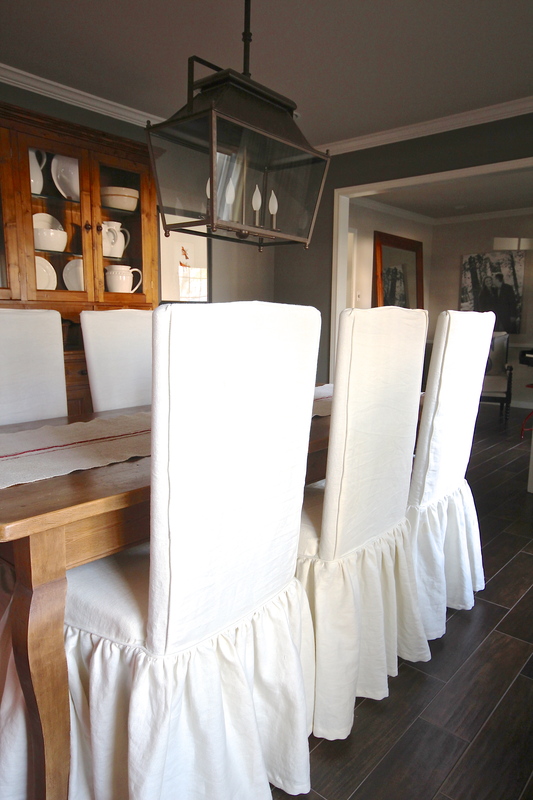 Are the dining room curtains simple white or cream panels? Hi there! I found this home on Pinterest, and am absolutely IN LOVE with it! Could you please provide more information about the beautiful pillows in the two slip covered chairs (where were they purchased, name of fabric pattern, etc.)? They are the white pillows with blue flowers, on a Lacefield fabric. Hi Samantha, this home is absolutely stunning! Where did you find the vase near the chalkboard, the patisserie sign and the light fixture/lantern above the formal dining room table? I wish I knew how to do chalkboard art! Where do I look for framed chalkboards like that? 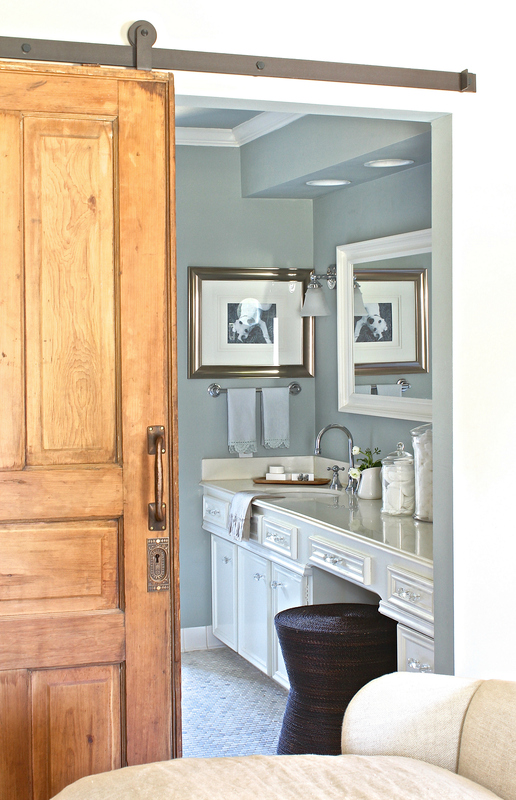 I LOVE that salvage door in the master bedroom/bath. Way too many details to name and adore. Thank you so much!